I accept PayPal, Square, cash and check for local classes. Contact me with questions about payment options. I do ask that classes be paid for in advance, at least 24 hours before the start of class. DOES NOT include a paid venue, tables/chairs or food/drink. Maximum number of students is 25. ** Children younger than 6 are accepted in the kid’s class, but parents must stay with the child and help them through the class. To reserve a private party or event, customers must choose an above package and provide a $50 deposit to claim their spot on the class calendar. Here at Blu Moon Art Studio, we are working hard to create online painting course content through our sister site, Painting with Melissa. Check out the site to see helpful articles, materials links and kits for beginner painters. Jump on the email list at Painting with Melissa to get FREE coupons to online courses as they are launched! There are a limited number of coupons available, I don’t want you to miss it! Large Group Discount (PRIVATE CLASSES ONLY): Any group of 15 or more students will be eligible for a 10% discount on the private class ticket price. All Tickets must be prepaid in one lump sum at least 1 week before the class date to be eligible for the Large Group Discount. 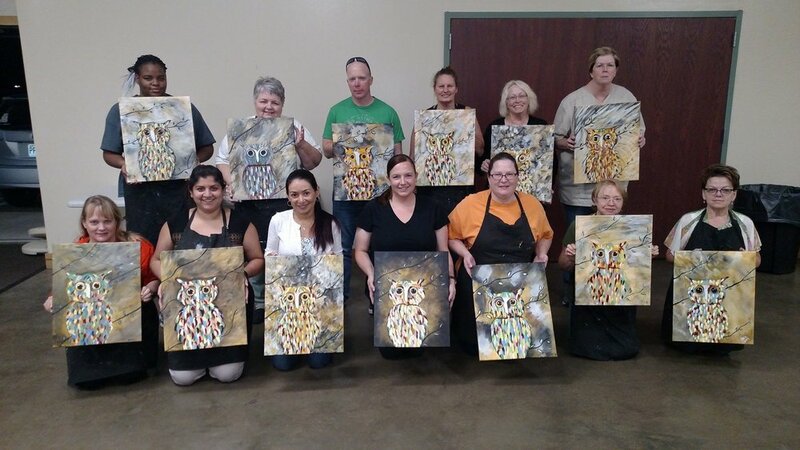 Rewards (PUBLIC CLASSES ONLY): Earn free classes when you attend Public Blu Moon Art Studio Classes! CLASS GIVEAWAY: Attend a public class with a minimum of 20 students, and get entered into a raffle for a FREE CLASS, chosen during the event!